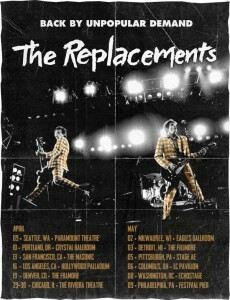 The Mats will play a string of 13-dates, starting in Seattle on April 9, and finishing up in Philly on May 9. Some of the notable stops include – an April 16 show at the Hollywood Palladium, and a May 5 show at Stage AE in Pittsburgh, Pennsylvania. Tickets for the Hollywood show went on sale today, use the presale code BEATBOX. Tickets are $69, of course they are. Tickets for the Pittsburgh show are on sale to the general public on February 20, mark your Day-Timer. The Hollywood show takes place on what is traditional known as Coachella Arrival Day, the Thursday prior to the Coachella Festival weekend. My trip up to the Hollywood Palladium for The Mats, and then off to Indio, California, aka The Promised Land, should make for a long but very memorable day. The group played the 2014 Coachella Festival almost exactly a year ago to the day. Up to this point, the Westerberg and Stinson led band has mostly played festival shows over the last two years. The band has left open the possibility of a new album down the road. We shall see! May 8: Echostage, Washington, D.C.